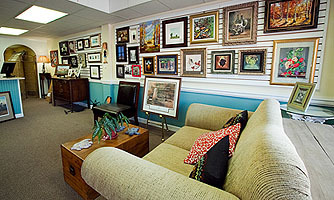 Lisa Lofthouse opened Lisa's Picture Framing in 1982 and it has been one of Fayetteville's premier custom framing businesses ever since. In January 2008, local native Robin Huske Kelly bought the business from Lisa. Robin kept the name because of its outstanding reputation in the community and simply added a robin bird to the logo! She ultimately consolidated two shops into one. The business relocated to its location in historic Haymount in May of 2010. It is easily accessible with convenient parking right in front. Carolyn Culbreth, a Cumberland County native, brings a wealth of knowledge and experience to the business. She has over 20 years experience and is a tremendous asset to the business. Carolyn has been a Certified Picture Framer through the Professional Picture Framers Association for 13 years and knows the framing business inside and out. When you want the most creative mind in framing, Carolyn is your person!